woo-hoo, bailey and i were featured on coffee with a canine's blog yesterday! wanna see us? just follow this link. 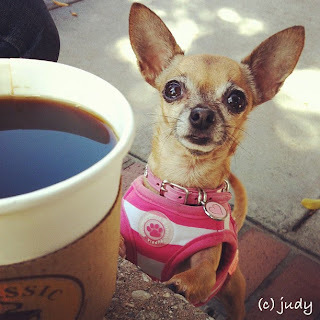 coffee with a canine is a blog about, you guessed it, coffee with your dog. since i have coffee with bailey on a daily basis, this was a perfect fit. come check us out! Labels: bailey, canine, coffee, photo by j.
Ohh, we enjoyed reading all about you Bailey, we often have coffee with Mum too, especially Bridget, who is practically and addict! OH MAN!!! You are finally published! Great job Bailey! :) We love all the pictures. You are too cute! :) Congrats. Oooh, we love that blog! Gonna go check it out right now!